They have their own sound, and their own attitude. 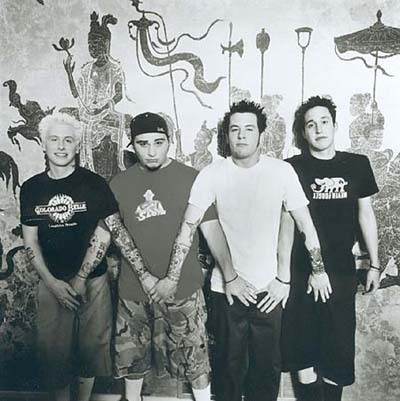 Mest is made up of Tony Lovato(Lead Vocals/Guitar), Matt Lovato (Bass)(the 2 are cousins that still live across the road from each other in their parents' houses), Jeremiah Rangel (Vocals/Guitar) and Nick Gigler (Drums). Their latest CD, is the most mature. Parts are very dark ("Night Alone", "Your Promise" both by Jeremiah Rangel) and parts are more upbeat, but still with a sad message ("2000 miles", "Lost, Broken, Confused" both by Tony Lovato). These are still the same ridiculously funny, party-loving guys that wrote songs like "What's the Dillio?" and "F*uck the Greyhound Bus"...but now they're more mature, that's all. It's good to know that they still have that crazy/reggae side to them, that shows in the hidden track "25 to Life" and in parts of "Burning Bridges".